Eleven former HBCU players and coaches are up for 2018 College Football Hall of Fame. The College Football Hall of Fame ballot for 2018 has been released and there appears to be a good shot that at least one person related an HBCU will be selected. Seven former players and four former coaches are on the ballot for next year. Four of those players competed at Mississippi Valley State: Vincent Brown, Ashley Ambrose, Parnell “Paydirt” Dickinson and Bob Gaddis. Also on the list is legendary Morgan State coach Eddie Hurt, along with former FAMU coach Rudy Hubbard. Hubbard led FAMU to the 1978 Division I-AA title. Former Hampton coaches Gideon Smith and Joe Taylor. The class will be announced on Jan. 8, 2018 in Atlanta, Georgia. Linebacker-1987 First Team All-American, leading the NCAA in tackles in 1986 and 1987…Set NCAA All-Divisions record with 570 career tackles…Two-time All-SWAC selection who led MVSU in tackles his last three seasons. Defensive Back-1991 First Team All-American and First Team All-SWAC selection…Named SWAC Defensive Back and Return Specialist of the Year in 1991…Led nation in punt returns during senior campaign. Quarterback-1975 First Team All-American and Pittsburgh Courier National Player of the Year…Four-time All-SWAC selection and conference Player of the Year as a senior…Finished career as SWAC’s all-time leader in total offense (7,442 yards). Free Safety-Three-time First Team All-America selection (1980-82)…Tallied 16 interceptions in 1983…1983 Black College Player of the Year…Two-time First Team All-Conference selection and Player of the Year (1981-82). Wide Receiver-1974 First Team All-American and Pittsburgh Courier National Receiver of the Year…Named 1970 NAIA Freshman of the Year en route to twice leading the NAIA in yards per catch (1971-72)…Three-time All-SWAC selection led conference in yards per catch all four years. Defensive Back-First Team All-America selection in 1994…Two-time Southern Intercollegiate Athletic Conference (SIAC) Defensive Player of the Year (1993-94) who led FVSU to two conference titles…Recorded 44 pass breakups and 17 interceptions, returning four for TDs. Defensive Back-1968 First Team All-America selection…Four-year letterman, who was named team MVP as a senior…Three-time CIAA All-Conference selection…1984 MDES Hall of Fame inductee. Captured back-to-back national championships, 1977 and 1978, including the inaugural NCAA Division I-AA National Title in 1978…Led A&M to back-to-back SIAC championships. 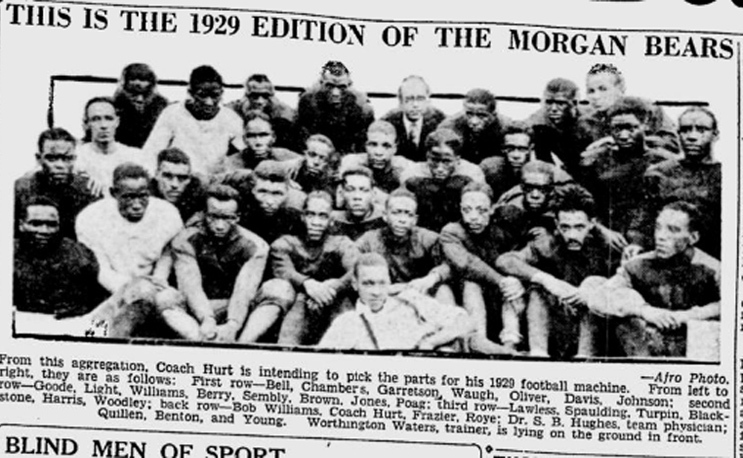 Led Morgan State to six Black College National Championship and 14 CIAA titles…Posted 11 undefeated seasons, including the 1943 team that did not allow a score from a single opponent…From 1931-28, led Bears to 54-game streak without a loss. Led Pirates to 1922 Black College National Championship… Recorded four CIAA titles and two unbeaten seasons in career…Longest tenured coach in Hampton history, boasting the second-most wins all-time at the school. Winningest coach in Hampton history (74%), leading Pirates to four Black College National Championships…Led teams to 10 conference titles and 10 playoff appearances throughout career…Four-time MEAC Coach of the Year.